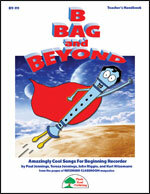 We've put together the first collection of fabulous recorder songs from our premierRecorder Classroom magazine. This versatile resource provides lots of flexibility for your classroom by giving you easier and harder versions of some of the songs, or faster and slower tempos, and plenty of teaching notes about the songs. Whatever the age or ability of your students, you'll find this an invaluable addition to your curriculum. B Cool - This Latin jazz flavored tune is a fun way to work on the note B, but it also has a version using B, A, and G, so you can use it with beginning players or challenge others and even perform it as a duet! You may use it as a lesson on improv, a warm-up, or as a chance to cement posture and hand position - it's full of options. Find A Happy Place - An upbeat, breezy jazz tune, this is fun, easy-to-play, and gives you the option of using both soprano and alto recorders. "Find A Happy Place" uses the notes B, A, and G on soprano and E, D, and C on alto recorder. The feel-good groove with a rollicking piano motif and some great improvised alto sax lines will make your students smile! Hungarian Rhapso-B - Franz Liszt might be cringing, but we had a lot of fun adapting his Hungarian Rhapsody No. 2 into a piece for recorder. While the wild and zany accompaniment clips along, all your recorder players have to do is play the note B. There is also an optional A towards the end of the tune. Sure to be a student favorite. Drifting Slowly - This is a nice exercise designed to teach the rhythm dotted quarter, eighth, quarter, quarter. It's a simple rhythm, but can sometimes be a bit of an obstacle. Set in a relaxed folk/rock style, the melody of this tune is distinctive, but limits the notes to just B, A, and G, so the players can concentrate on the rhythms. Cheesy Feet - We've provided both a cool and mellow, swingin' jazz arrangement of this tune and a sharp and crunchy, funky rock arrangement, so you can choose whatever flavor suits your mood. In both arrangements, the notes B, A, and G are used, with the option of adding E on the funky edition for your more advanced players. It is also a great chance to talk about and have your students try improvisation. You'll appreciate how useful this recorder collection is and your recorder students will really enjoy all of the fun songs. The downloadable version gives you the same pages and recordings as the print version, but in the form of PDFs and MP3s. The CONVENIENCE COMBO KIT includes both the printed Handbook and CD, as well as the downloadable files.